Combine tomatoes, radishes, peppers, onions, lime juice, mint and salt in mixing bowl; stir thoroughly and refrigerate until needed. Remove rind and cut watermelon into 8 square pieces (approx. 3 long x 1 thick); pre-heat grill pan to medium high heat. Grill watermelon on prepared pan about 2 minutes per side, until grill marks appear. 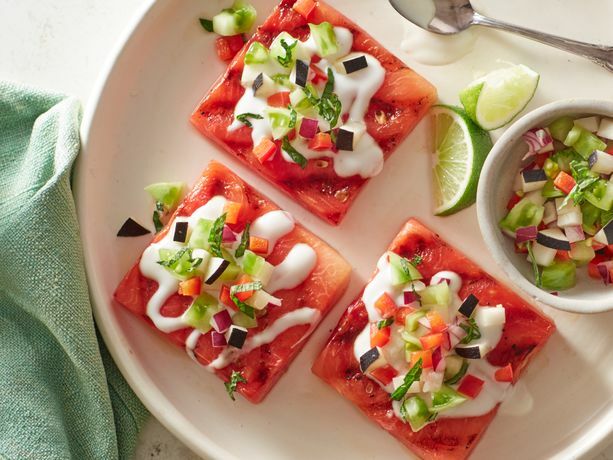 Serve each slice topped with 0.5 oz drizzle of yogurt and 1 oz pico.